My Comment about ALEA Small Box Series. Quite Good Games. 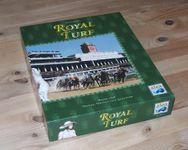 A few minor change from Royal turf to Winner's circle. Only game that I never play in this series. Actually I never see this game. Maybe never imported to Korea. Previously Had it but sold it. But I'm not that enthusiastic to this game as others are.